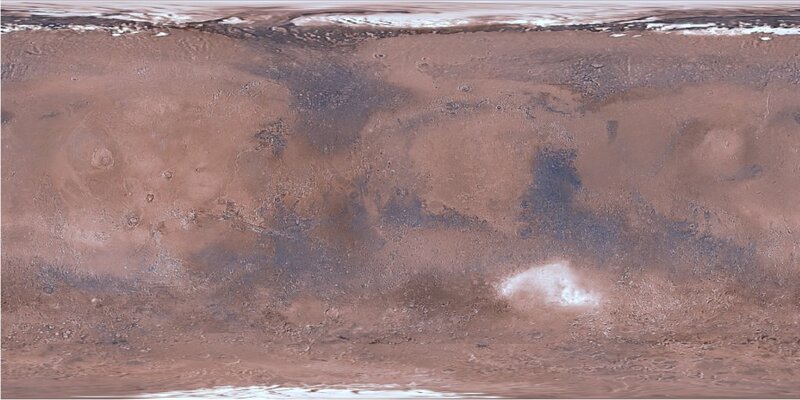 This global image map of Mars has a resolution of 256 pixels/degree (scale approximately 231 m/pixel at the equator). The colorized mosaic was completed by NASA AMES which warped the original Viking colorized mosaic and blended over the latest black/white Mars Digital Image Model (MDIM 2.1). The positional accuracy of features in MDIM 2.1 is estimated to be roughly one pixel (200 m), compared to 3 km for MDIM 2.0 released in 2001 and >6 km for MDIM 1.0 released in 1991. In addition to relatively imprecise geodetic control, the previous mosaics were affected by changing definitions of cartographic parameters (such as the definition of zero longitude), resulting in an overall longitude shift of as much as 0.2° between the early MDIMs and other datasets. The new mosaic uses the most recent coordinate system definitions for Mars. These definitions have been widely adopted by NASA missions and other users of planetary data and are likely to remain in use for a decade or more. As a result, MDIM 2.1 not only registers precisely with data from current missions such as Mars Global Surveyor (MGS) and 2001 Mars Odyssey but will serve as an accurate basemap on which data from future missions can be plotted. The basis for the positional accuracy of MDIM 2.1 is the incorporation of all images in the mosaic into the evolving USGS/RAND global control network of Mars. The primary reason for the greatly improved absolute accuracy of the current version of this network is the incorporation of 1232 globally distributed "ground control points" whose latitude and longitude were constrained to values measured from Mars Orbiter Laser Altimeter (MOLA) data. The globally adjusted MOLA dataset has an absolute horizontal accuracy on the order of 100 m, but individual features in images can probably only be tied to MOLA-derived shaded-relief digital image models with a precision on the order of 200 m. Other, lesser contributors to the accuracy of the control solution and mosaic are the use of MOLA-derived elevations for all 37,652 control points, use of updated timing and orientation data for the Viking Orbiter spacecraft, improved measurements of reseau locations in the images leading to more accurate correction of image distortions, and careful checking and re-measurement of control points with large solution residuals. The mosaic is also orthorectified based on the MOLA elevation data, so that parallax distortions present in the earlier versions are eliminated. The root-mean-square (RMS) error of the control solution is 16 micrometers (1.4 Viking image pixels, or ~300 m on the ground). Visual inspection of the mosaic indicates that both image-to-image seam mismatches and image-to-MOLA registration errors are less than one pixel almost everywhere, with maximum errors on the order of 4 pixels (1 km) occurring in only a few locations. The cartographic constants used in MDIM 2.1 are those adopted by the IAU/IAG in 2000, which have been adopted by the majority of Mars missions and instrument teams. Coordinates (e.g., of the boundaries and centers of the individual files or map quadrangles making up the mosaic) are given in terms of east longitude and planetocentric latitude. The files in cylindrical (Equirectangular) map projection are also constructed so that lines of the map raster are equally spaced in planetocentric latitude. These files will thus register with other datasets based on planetocentric latitude either as-is or after a simple change of scale, but must be resampled in order to register to datasets based on planetographic latitude. The global mosaic is divided into 30 regions based on the USGS Mars Chart (MC) series of 1:5,000,000-scale printed maps. All regions are available in Equirectangular projection, which is a generalization of the more familiar Simple Cylindrical projection. Quadrangles 2-29 are provided only in Equirectangular, with center latitude of projection 0° this projection is identical to Simple Cylindrical. The polar quadrangles 1 and 30 are available in two Equirectangular sections with center latitudes of projection ±60° and ±75.52248781° respectively, and also as a single file in Polar Stereographic projection. The two Equirectangular sections of the polar quadrangles can be converted to center latitude of projection 0° (or equivalently to Simple Cylindrical projection) by 2:1 and 4:1 enlargement in the sample direction, respectively, after which they can be merged with the lower latitude data. 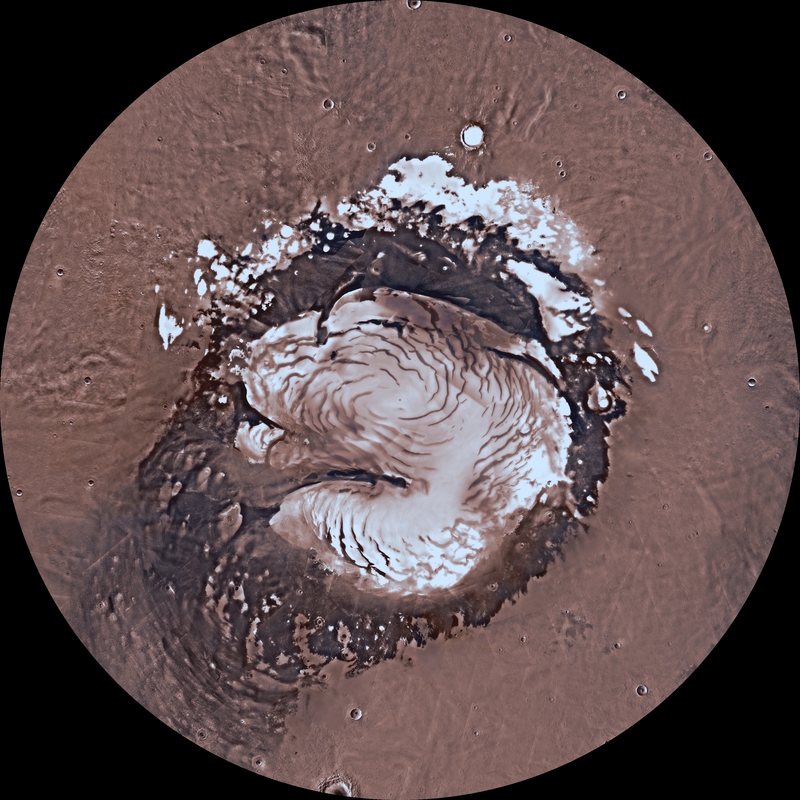 The images used to make MDIM 2.1 were obtained primarily through the red, clear, and minus-blue filters of the Viking Orbiter imaging system, and thus provide a monochromatic view of Mars weighted toward the red end of the visible spectrum. Images were obtained with a wide range of solar incidence angles. It is unfortunately not possible to correct the appearance of both albedo (reflectivity) variations and topographic features for these incidence angle variations simultaneously. The images have therefore been high-pass-filtered at a scale of ~50 km to remove regional albedo variations and then normalized so that equal topographic slopes appear with equal contrast everywhere. Photometric processing for MDIM 2.1 incorporates a model of the transmission and scattering of light in the atmosphere that is substantially improved over that used in MDIM 2.0. Residual tonal mismatches between different images after photometric correction were corrected based on a least-squares adjustment of image brightness and contrast. Because of these photometric and cosmetic improvements, it was possible to use a less severe high-pass-filter than for MDIM 2.0, improving the overall appearance of the mosaic. To make an artistically colorized version of the latest controlled Mars Digital Image Model (MDIM). The grayscale version of the MDIM2.1 replaces two earlier mosaics produced by the USGS from the same set of approximately 4, 600 Viking Orbiter images. 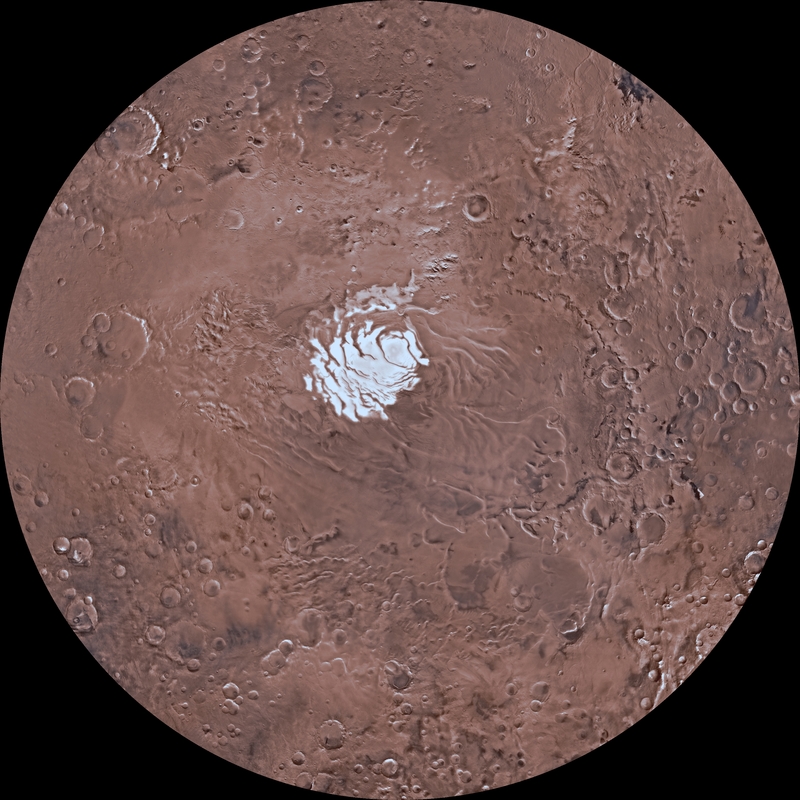 The new mosaic uses the most recent coordinate system definitions for Mars. These definitions have been widely adopted by NASA missions and other users of planetary data and are likely to remain in use for a decade or more. As a result, MDIM 2.1 not only registers precisely with data from current missions such as MGS and 2001 Mars Odyssey but will serve as an accurate basemap on which data from future missions can be plotted. This Mars mosaicked digital image model (MDIM) incorporated roughly 4600 Viking Orbiter images and provides gap-free coverage of the Martian surface. The colorized mosaic was completed by NASA AMES which warped the original Viking colorized mosaic and blended over the latest black/white mosaic (MDIM 2.1). The original MDIM 2.1 is a specialized cartographic product generated from Viking Visual Image Subsystem (VIS) data (primarily the red, minus blue, and clear bands) described above, where albedo (surface brightness) was removed from the VIS mosaics, emphasizing topographic features. The images underwent noise removal, radiometric, geometric and photometric correction, reseau removal, and tone matching. It is unfortunately not possible to correct the appearance of both albedo (reflectivity) variations and topographic features for these incidence angle variations simultaneously. The images have therefore been high-pass-filtered at a scale of ~50 km to remove regional albedo variations and then normalized so that equal topographic slopes appear with equal contrast everywhere. Photometric processing for MDIM 2.1 incorporates a model of the transmission and scattering of light in the atmosphere that is substantially improved over that used in MDIM 2.0. Residual tonal mismatches between different images after photometric correction were corrected based on a least-squares adjustment of image brightness and contrast. Because of these photometric and cosmetic improvements, it was possible to use a less severe high-pass-filter than for MDIM 2.0, improving the overall appearance of the mosaic.